The pyramids of Egypt form the backdrop to the action in Book of Gods, a 5 reel, 243 ways to win video slot from Big Time Gaming. This trip back to the land of the pharaohs comes with special cloning symbols that can fill whole reels. There’s also a bonus round that can award unlimited free spins. Play on all devices from between 10p and £40 per spin. There’s a classical look to the design here. Inside the intricately designed columns are lower value royals plus 4 more rewarding Egyptian animal gods. The best of these is the cat god Bastet. Land 2, 3, 4 or 5 of these on adjacent reels then you’ll pocket an award of 2, 5, 10 or 30 times your bet. The Book of Gods logo pays the same as Bastet. It also acts as both a wild and a scatter. When it comes to features, there are 3. Symbol Cloning feature – on each spin, you’ll see symbols appear on a plinth to the side of the reels. Which symbol is live changes with each spin. If you land a winning combination made up of the symbol on the plinth, then they expand to fill the whole of the reel. A payout calculation is made with the expanded symbols in play. Free Spins feature – an allocation of 15, 20 or 25 free spins is awarded if you manage to land 3, 4 or 5 Book of God scatters on the same spin. On each free spin, 1 of the higher value symbols could expand. Once again, they’ll expand to fill the whole reel if it coincides with a matching winner. Landing 3 scatters delivers a re-trigger. Another of the higher value animal god symbols will turn into a cloning symbol too which can really boost your winning opportunities. If you don’t want to wait, you can buy the feature with the Feature Drop feature. The price is displayed in the top right corner of the screen. Special tokens can land which can deliver a discount of 0.5 times your bet to the price to buy. There are seemingly endless Egyptian-themed video slots available. This is one of the better ones. 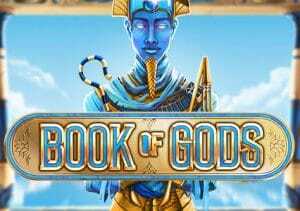 Well designed with decent features, the medium to high variance Book of Gods is worth a look – you could also win 5,000 times your bet on every free spin. If you like big win potential, Big Time Gaming is the developer you want – The Final Countdown can give you wins of 36,000 times your bet on every free spin.